It’s hard to believe anyone can consider Matt Cassel to be starting quarterback material after his last couple of seasons with the Chiefs, but the Minnesota Vikings don’t have a much better option as their number one quarterback. Christian Ponder had his moments last season, but a lot of what he showed was disappointing, giving the franchise some doubts regarding his ability to lead them in the future. For now, even with the knowledge that a mediocre receiving core (with the addition of Greg Jennings but the departure of Percy Harvin) isn’t going to make Ponder look too great, this is a rush-first and second team, geared to give Adrian Peterson plenty of touches, hoping his legs can take the punishment in the way he did last season, nearly breaking the record for most rushing yards in a season. There’s also the Joe Webb option, but he’s there for a guy who can play read-option teams during practice, and maybe even get some snaps as a wide receiver, which was the plan initially last season for him. Webb might also be used a trade bait during training camp, but after two starts in his first three seasons in the NFL, it’s hard to see what they’ll get for putting him on the trading block. For a team that made the playoffs last season, the Vikings aren’t that optimistic about making huge strides next season. While there have been slight upgrades here and there, nothing too meaningful has occurred. Maybe they’ll land gold in the draft, without anything clearly sticking to mind about a specific player they might be trying to sign. They’re main hope is that Ponder, entering his third NFL season, will start living up to his first round status, and reduce on the length of his bad stretches that seem to go on for half a season. 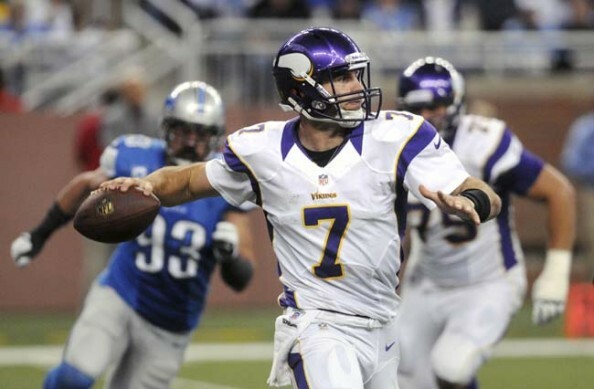 Being a run-first team isn’t such a bad thing to plan on in the changing NFL, but unless Ponder can become a quarterback who can make plays without having to depend on Peterson or just one receiver bailing him out, we might get to see Matt Cassel get another chance to start in a league that seems a bit too big for him.